As large parts of the nation recover from nature's one-two punch—an earthquake followed by Hurricane Irene—building researchers from the National Institute of Standards and Technology (NIST) warn that a double whammy of seismic and wind hazards can increase the risk of structural damage to as much as twice the level implied in building codes. Wind zone map shows how the frequency and strength of extreme windstorms vary across the United States. 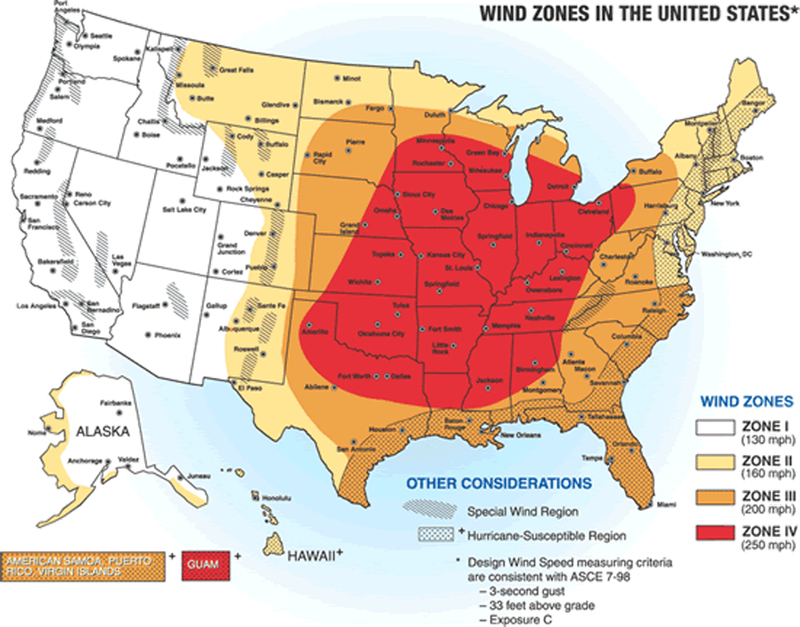 Wind speeds in Zone IV (red), where the risk of extreme windstorms is greatest, can be as high as 250 miles per hour. This is because current codes consider natural hazards individually, explains NIST's Dat Duthinh, a research structural engineer. So, if earthquakes rank as the top threat in a particular area, local codes require buildings to withstand a specified seismic load. In contrast, if hurricanes or tornadoes are the chief hazard, homes and buildings must be designed to resist loads up to an established maximum wind speed. In a timely article published in the Journal of Structural Engineering,* Duthinh, NIST Fellow Emil Simiu and Chiara Crosti (now at the University of Rome) challenge this compartmentalized approach. 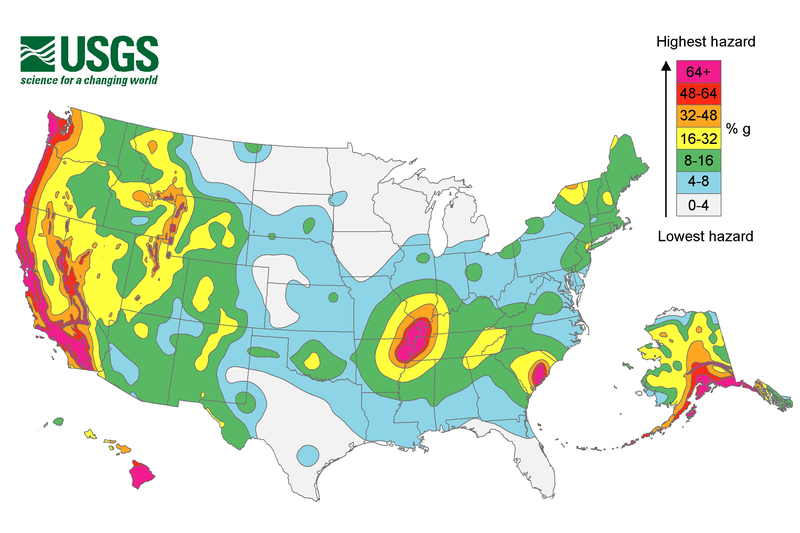 They show that in areas prone to both seismic and wind hazards, such as South Carolina, the risk that design limits will be exceeded can be as much as twice the risk in regions where only one hazard occurs, even accounting for the fact that these multiple hazards almost never occur simultaneously. As a consequence, buildings designed to meet code requirements in these double-jeopardy locations "do not necessarily achieve the level of safety implied," the researchers write. Simiu explains by analogy: a motorcycle racer who takes on a second job as a high-wire performer. "By adding this new occupation, the racer increases his risk of injury, even though the timing and nature of the injuries sustained in a motorcycle accident or in a high-wire mishap may differ," he says. "Understandably, an insurer would raise the premium on a personal injury policy to account for the higher level of risk." The researchers developed a method to assess risks due to wind and earthquakes using a common metric of structural resistance. With a consistent measure (the maximum lateral deflection), the combined risk of failure can be compared to the risk that design limits will be exceeded in regions vulnerable to only one of the hazards, the basis for safety requirements specified in current building codes. They demonstrate their approach on three different configurations of a 10-story steel-frame building. One of the configurations used so-called reduced beam sections (RBS) to connect girders to columns. RBS technology was developed after California's Northridge earthquake in 1994, which resulted in significant structural damage in new and old buildings due to unanticipated brittle fractures in frame connections. Shaped like a dog bone, tapered RBS connections made the frames more ductile—better able to deflect without breaking. In this case study, the researchers found that RBS connections do not decrease the risk that a steel-frame building will exceed its design limit when used in a region exposed to high winds or a region exposed to high winds and earthquakes. Consequently, the risk of failure doubled under dual-hazard conditions, when those conditions are of similar severity. However, they note that RBS connections can decrease the risk that limits associated with seismic design will be exceeded during the structure's life. The researchers are continuing to extend their methodology and are proposing modifications to building codes. * C. Crosti, D. Duthinh and E. Simiu. Risk consistency and synergy in multi-hazard design. ASCE Journal of Structural Engineering. Vol. 3, No. 8, Aug. 2011.